A special issue will be published after the conference in the Journal of Outdoor Recreation and Tourism (JORT). 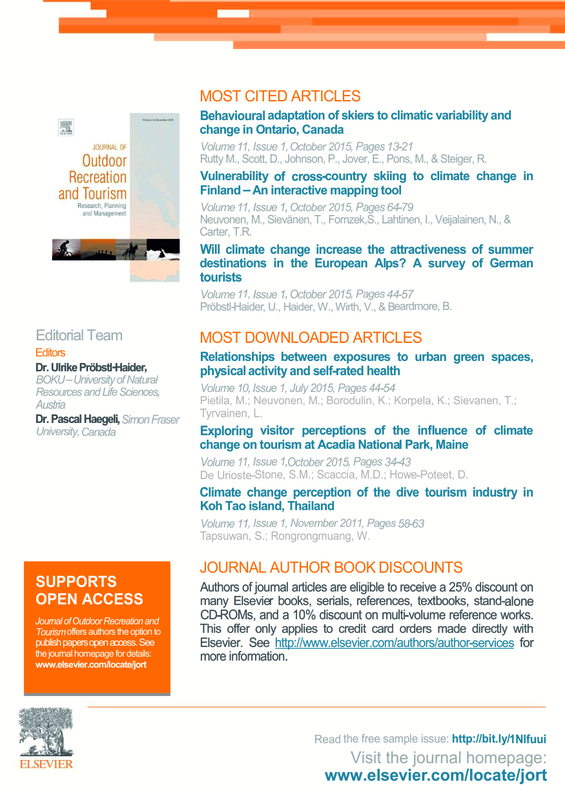 All papers for the special issue should primarily focus on nature, culture, and health issues and their relationship with tourism. 1. Write a full paper in accordance with the guidelines of the journal in which you would like to publish your research. For the themed and special issues, please also carefully read the relevant call for papers. 2. 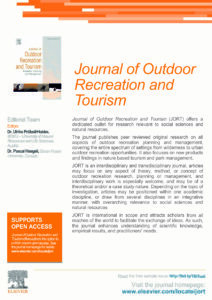 Please indicate in the cover letter addressed to the journal’s editor that the research included in your paper has been presented at the Tourism Naturally Conference, Austria, 2018. Selected papers will be considered for publication in the International Journal of Spa and Wellness. The International Journal of Spa and Wellness is the first, peer-reviewed research journal for Spa and Wellness. 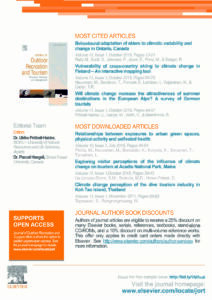 The journal publishes high quality international, multi-disciplinary research. It also serves as a platform for international practitioners in the fields of spa, health and wellness to showcase industry best practice. All manuscripts published in the journal are peer reviewed by accomplished experts in the topical area. Being a multi-disciplinary journal, its readership is diverse encompassing academics, practitioners and policy makers. For more information, please visit the journal’s website. The field of winter sport and winter tourism is of special importance for the host country of Austria and the province of Salzburg, where the Tourism Naturally Conference 2018 will take place. But at the same time, this book aims to give a truly international overview on the current situation and challenges as well as on future developments in winter tourism around the world. The book will be published by CAB International (CABI) which is an inter-governmental, not-for-profit scientific research and publishing organization. They use their revenues to support scientific and rural development projects that help improve the lives of the world’s poorest people. With over 25 years’ experience, CABI is a respected publisher of tourism databases and over 200 tourism books and has a huge network of internationally renowned experts.